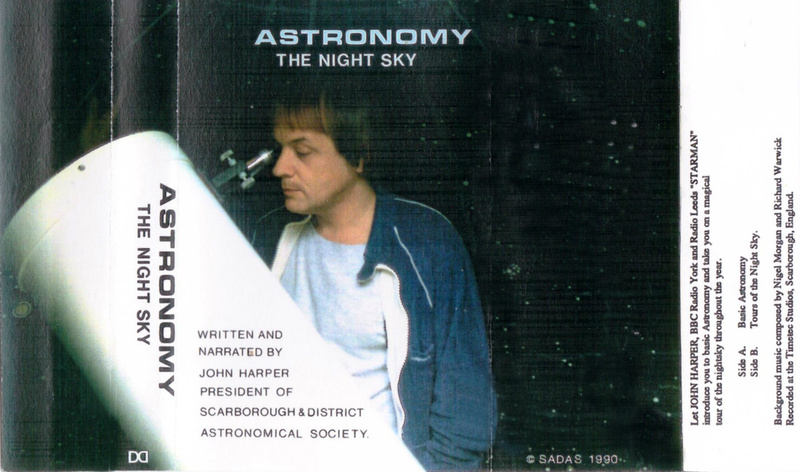 The Scarborough and District Astronomical Society was founded on February 21st,1976 by John Harper F.R.A.S., its President. After meeting at the Osgodby Community Centre on the southern outskirts of Scarborough, it moved to the old North Riding College on Filey Road (Now, the Scarborough Campus of the University of Hull), then into the town’s library. Scarborough Astronomical Society's present home is East Ayton Village Hall, four miles west of Scarborough. In recent years the Society was renamed the Scarborough and Ryedale Astronomical Society, to more accurately reflect its membership, and the establishment of the Astronomy Centre at Low Dalby. Sir Patrick Moore F.R.A.S. opened this facility in 2001. 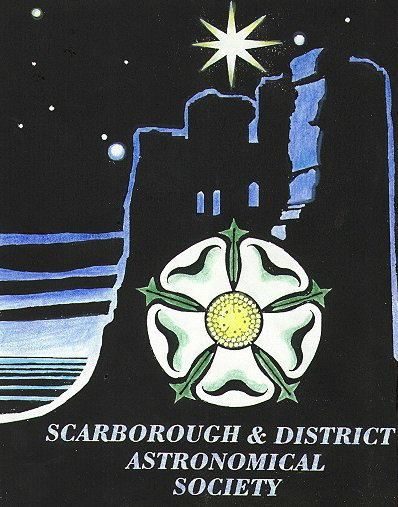 When I founded Scarborough Astronomical Society in the February 1976, having the previous year taken up the post of Head of Religious Education at Scalby School, its members were from the Borough of Scarborough, hence its first name. However, as the years started to go by, and the growing Society moved from the Osgodby Community Centre, into the town , many more members joined. some of whom came from further a field. As a result, I changed the name to Scarborough and District A.S. When BBC Radio York started broadcasting in this area I was invited to give monthly broadcast slots about what was happening in the night sky, and that further encouraged people to join and share their hobby. During this time many events called 'star parties' were arranged in a variety of locations, including Oliver's Mount, where, in 1986, over a thousand people came up to the top of the Mount to observe Halley's Comet, on its 76 yearly return, during the week when the comet was nicely visible in the telescope that I was able to use at that time. Subsequently, when Yorkshire Coast Radio came into being, with its first studio on Falsgrave Road, I was often invited to speak about events taking place in the sky, and the star parties that were being held, and even for a short time, dare I say it, a monthly slot looking at the accepted astrological attributes of the Signs of the Zodiac! - AH, Well, even the great astronomer Tycho earned some of his 'bread and butter' telling fortunes and producing horoscopes ! --- I hasten to point out I do not do the latter two items. 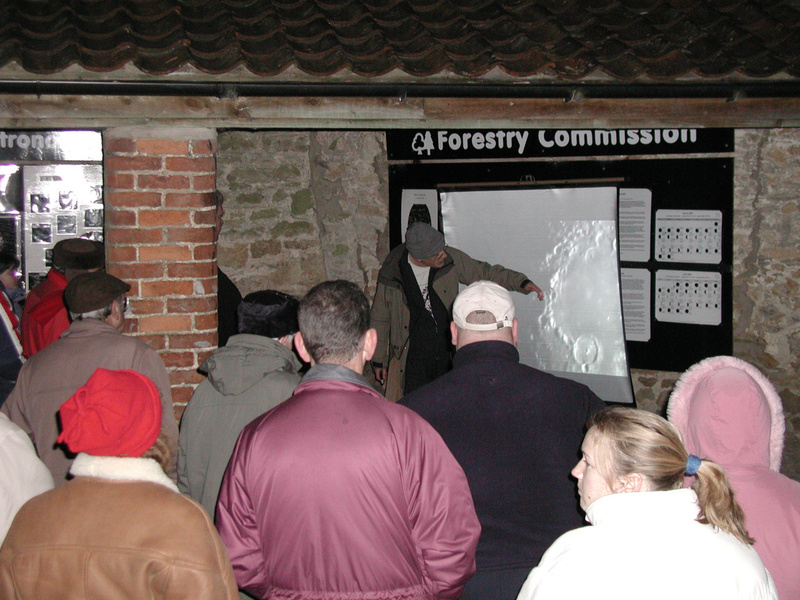 In the 1990's many people from the Ryedale District were becoming members and in 1999, with the good rapport we had with the then 'Forestry Commission', now 'Forest Enterprise', we were allowed to put up two observatories, near to the Courtyard site of the Community Centre in the village of Low Dalby. it was at this time I changed the Society's name a final time to: Scarborough and Ryedale Astronomical Society, the Society became a charity also at this time and I created the badge. As you can see, the background colour of the badge, I designed for the Society, is dark blue, to represent the night sky. 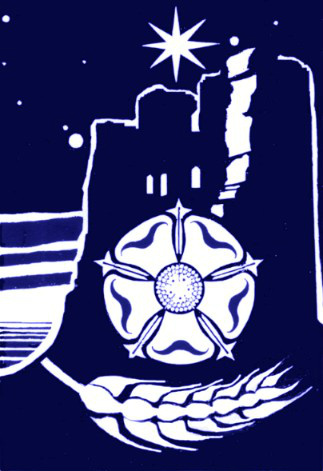 The motifs on the map include the outline of Scarborough Castle's keep, the white rose of the county and an ear of rye. The stars are those of the constellation Auriga, the Charioteer. The brightest star is Capella, which is close to Scarborough's zenith (the point overhead) each sidereal day. and to Capella'e lower left is Menkalinan, Auriga's second brightest star. 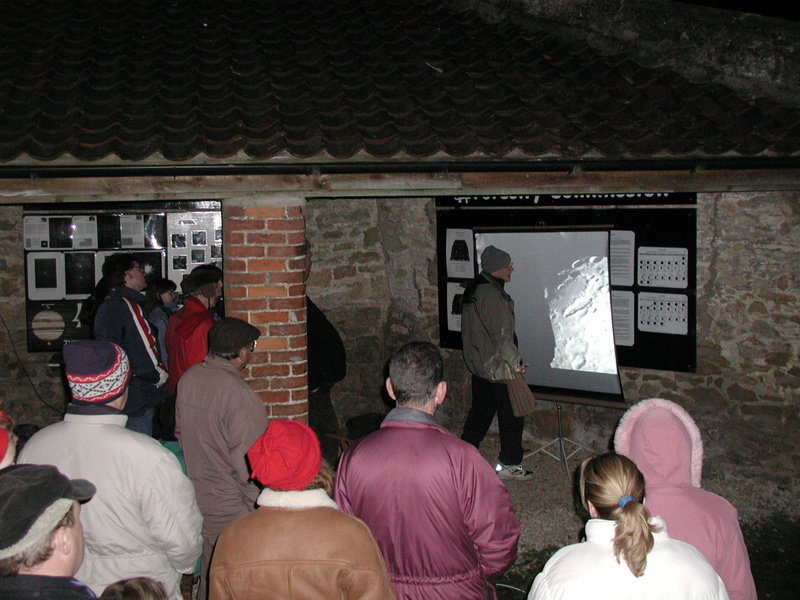 Eclipses of the sun and the moon have been highlights of the Society's public observing program, and when these have taken place we have always provided the opportunity for local residents to view the event through the specialised equipment we have. 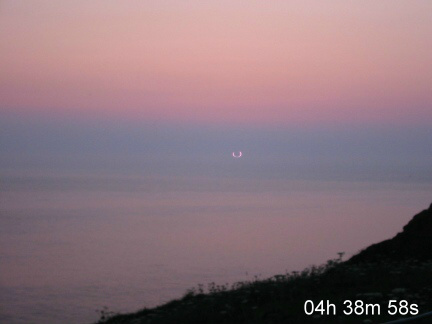 Such an event was the solar eclipse I called "The Devil's Horns" eclipse because this *annular eclipse of May 31st 2003 was seen as such in northern Scotland. but from Scarborough it was a deep partial event, which was at its best at sunrise. So we advertised it as such and many people turned up at 4 AM in the morning to get the best vantage point on the cliff slope above the Spa in order to enjoy the special sunrise of that day. 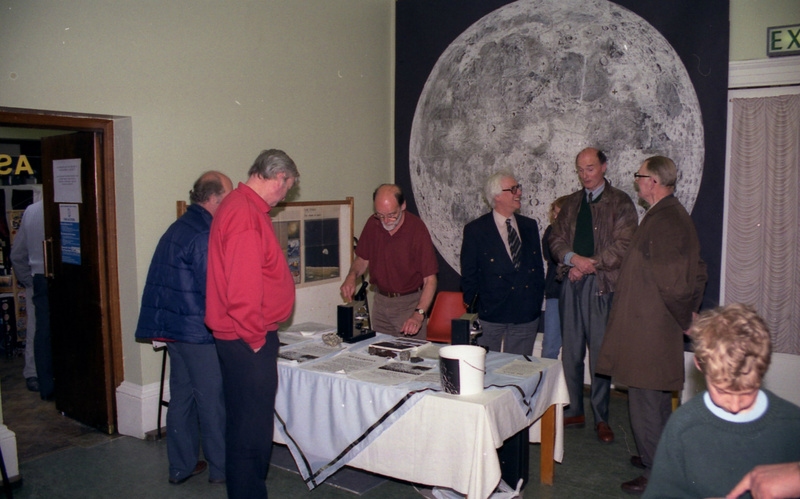 SCARBOROUGH & RYEDALE ASTRONOMICAL SOCIETY entered its 44th year of existence on THURSDAY, FEBRUARY 21st, 2019. I would like to acknowledge here the members who helped me establish this Society in those early days. AUDREY WILSON of the Osgodby Community Association, who allowed the Society to come into being at the Osgodby Community Centre on Osgodby Lane in 1976. MARK WISON, who was the first secretrary. ANDREW KING, the first Treasurer. DAPHNE and REG WATERWORTH Long time members, Reg was in The Webb Society and excelled in measuring the Position Angles and Separations of various binary stars. His favourite, I believe, was Delta Herculis! They were the Society's representatives in Pickering, and supported our Star Parties vigorously. JOE SHAAF from South Carolina in the USA was the first member to donate a telescope (a 6" Newtonian reflector) to the Society. TONY NIXON Now at the Royal Observatory in Greenwich as a guide. Tony was one of the founder members who introduced a monthly news sheet which he photocopied and distributed amongst members. He now lives in Croydon. MARTIN CLARKE Marin and I organised the Friday Night observing at my Observatory in Throxenby Lane, which included amongst other things observing and plotting the paths of a number of main belt asteroids (dwarf planets), comets and deep space objects. TINA and RICHARD WARWICK. Tina remains one of the longest serving members of the Astronomical Society, and in the early days encouraged me to keep the Society going, for which I thank her greatly. After a Perseid Meteor Watch and count above Hackness, she rushed us back into Scarborough in order to observe a very close conjunction of Venus and Jupiter, which were less than 30 arc minutes apart in the early morning aky. Both planets were visible in the same field of view, and Tina went around the cars in the Holbeck Car Park waking people up and dragging them to see the delightful appearance of the two planets in the telescope. Tina was society Treasurer for many years. ALAN DOUGLAS, Tina's father, was a great supporter of the Astronomical Society. ROB OVERFIELD A staunch and enthusiastic member of the Astronomical Society; together Rob and I set up our First Messier Marathon in a good observing area above Sawdon. Many members attended, and on a clear but freezing night in March we star hopped to a total of 76 objects. There were no 'goto' facilities in those days. At 04h 30 we were beaten by the frost !!! This record for us, has not yet been beaten within the Society. LAURA GREY. Laura now lives in France but she was a great supporter at our star parties. She assisted Sheila and Tina with the distribution of our famous 'Green Alien Soup' and is the expert at giving star party visitors the best ground views of the Pleiades! NEIL WOODHEAD, Neil was a good Society Chairman, and astronomer. When he married Gillian at Nottingham Parish Church. They set up home just outside that city, where they live to this day. DEIRDRE BORE, our member from Hornsea who supported our star parties by bringing her very long focal length refractor, which, when set up, looked like a huge gun. Albireo was a sight to behold through this instrument. GEOFF and HILDA BROWN, a lovely couple from Kirby Moorside. Jeff was interested in satellites and had been involved in their construction. He gave several talks on this subject. MARK DAWSON Mark and his friends came down from Whitby to our meetings and asked us to set up a star party on the Abbey Plain above the town, which we did. Mark was so impressed with the number of Whitby folk who came along to look through our telescopes that he later went on to form the Whitby and District Astronomical Society. 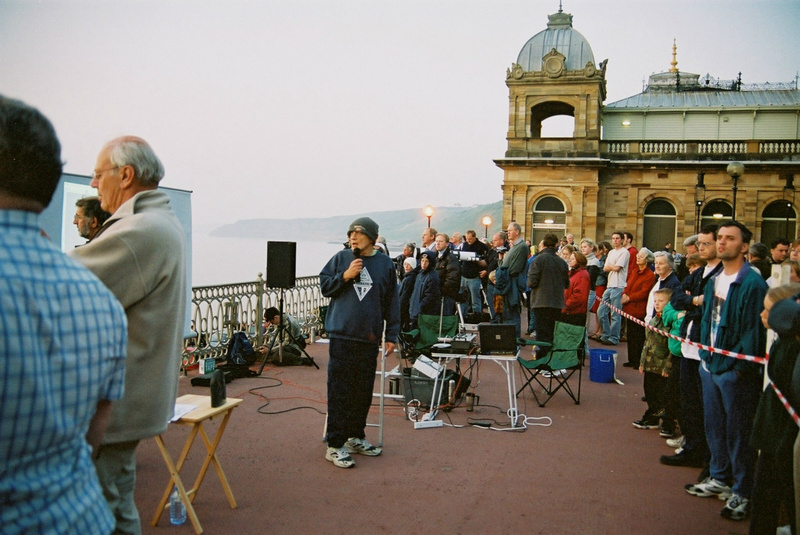 The members hold numerous star parties of their own in the vicinity of Captain Cook's monument on the West Cliff. The Whitby Society has the use of the Observatory at the town's community college, which houses a historical Thomas Cook of York Refractor, of fair size. Thanks to Ian Lilleyman for this photograph. Two big library exhibitions with slide show presentations have been staged in Scarborough Public Library. For each of these we were able to put on show the priceless samples of Lunar material brought back to earth by the various Apollo Missions, which were on loan to the UK from NASA. In order to bring them to Scarborough at that time, we had to ensure their security. So we had the lunar samples kept in a safe in the Fylingdales Early Warning Station, when they were not on show! We also obtained a collection of the three types of meteorite, Siderites (irons), Aerolites (stones) and Siderolites (stony-irons)* to put on show for people to inspect; also microscopic slides of thin sections of lunar rock to show the crystaline structure. *These terms are now becoming obsolete, as numerous sub-divisions of the three main types of meterorite are recognised. 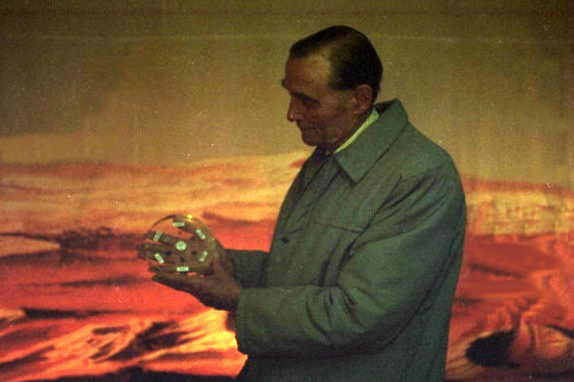 Both of these exhibitions had mayoral recognition, and were highly popular, especially as people were allowed to hold the encapsulated,priceless lunar material in their hands, so that they could say they had help pieces of the moon. 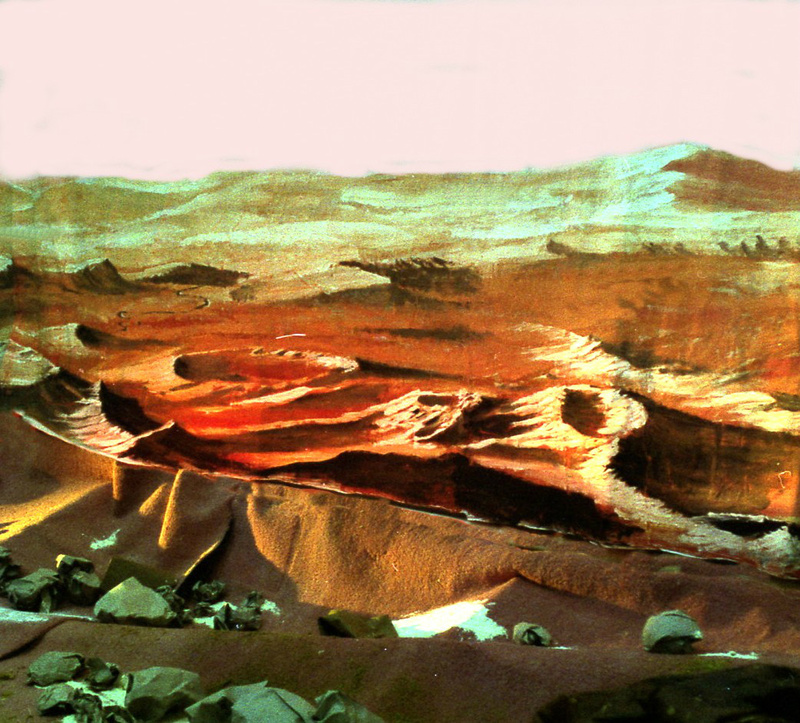 On the occasion of these exhibitions the map I had made of the moon (largest exhibitional lunar map in Britain at the time was on display , as was a model of the surface of the Planet Mars. This features mist produced using dry ice in a smoke machine to add autheticity to the scene we had created. 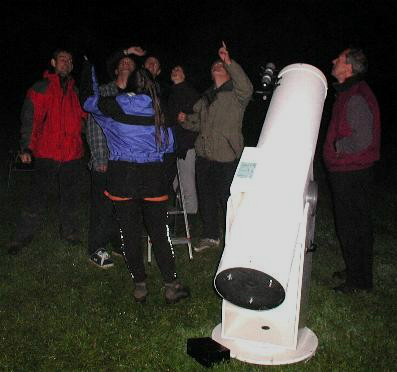 STAR PARTIES AT LOW DALBY, AND STARFESTS IN DALBY FOREST. As a result of a Workers Education Course in Astronomy which I ran at Lady Lumleys School in Pickering; one of my students, Pippa, was a Forest Educational Ranger from the North Yorkshire Forest at Dalby. Aa a result of this meeting, the Society was welcomed into Dalby Forest and was given a plot of land adjacent to the old Visitors centre near the Courtyard in Low Dalby Village. 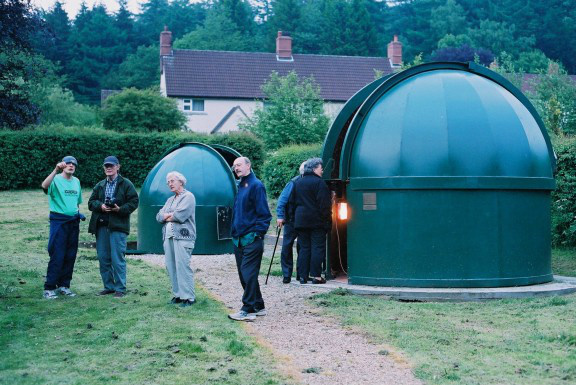 Here we erected our two observatories which were to become the centre of the Astronomy Facility, opened by Sir Patrick Moore, to the delight of members and the Low Dalby village community. The larger of the two domes was made from marine plywoodand painted 'forestry green' to match the trees, and so fit in readily with the area. The interior of the large dome I painted to show the 3000 naked eye stars it was possible to identify, and the constellations visible from that location. During inclement weather the dome was large enough to entertain our Visitors on 'star party' nights, which for many years were held on the first Friday of every month with the exception of August, During that month we took an active part in the 'Night Watch' event the Forestry Commission as it was known then, put on; a real festival of natural history, with moths, owls, nightjars, and of course, stars! During this time Ryedale District Council allowed the village light near the domes, to be fitted with an on/off switch so that when observing the dark night sky, the light could be switched off. I instigated the first 'Starfest 'event in 2001. 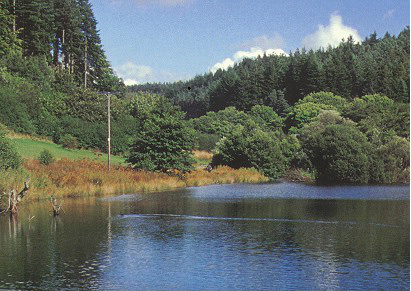 The aim was to set out a weekend camp during the Summer holidays, in a dark site within Dably Forest, which amateur astronomers, and their families could attend. During the day they had the opportunity to explore the forest and the North York Moors National Park; at night they could persue their hobby and look at the heavens in the company of like-minded people. 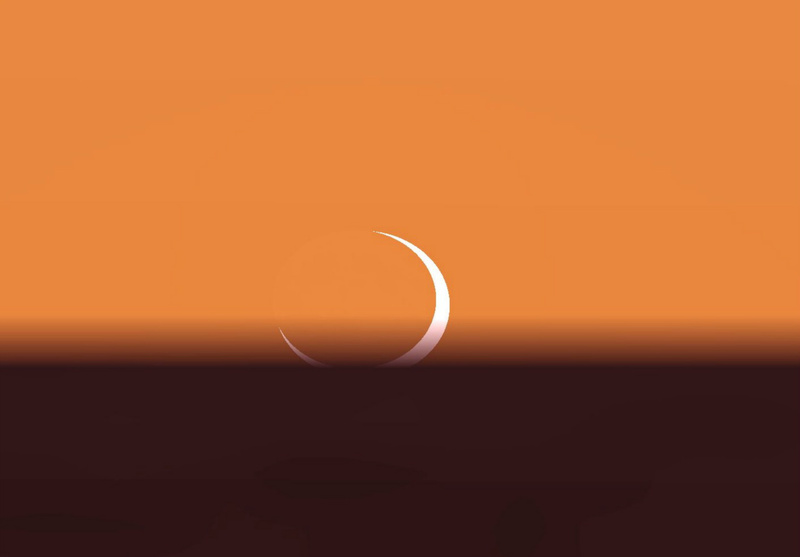 The event was always held around the time of new moon, which ensured that there was no natural light pollution to spoil the views and images of faint, distant deep space objects they could make. Starfest proved to be very popular and attracted amateurs from Devon, Wales, Cumbria and even Hong Kong! This year, the fifteenth Starfest will take place. At my invitation the Mayors of Scarborough and Pickering together with the Chairman of the Ryedale District Council came to many of the opening events, to the delight of the visitors. The civic dignitaries enjoyed looking through the many telescopes which were being set up. Truly dark skies for Starfest until someone takes a flash photograph! Bryan Moiser ( Secretary, Scarborough and Ryedale Astronomical Society.). Telescopes will be set up at the top of the car park, nearest to the sea and Filey Brigg. This will give a good view to the south allowing us to see Saturn, the craters of the moon, Albireo and other wonders of the night sky as we await the celestial firework display once it is dark enough. The event is free and open to all. You are advised to bring warm clothing and if possible something to sit or lie on as you relax and count how many meteors appear. The event is weather dependent so please check on here before setting off. A message will be posted by 9pm on 12 August indicating whether the event is going ahead or not. The event will end no later than 2.00 am.